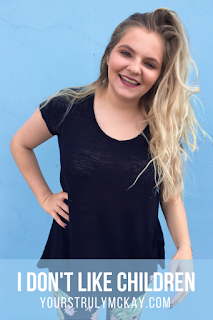 I am more than open about my experiences with Depression (with a capital d) and Anxiety (with a capital a). It's always a little bit scary for me to meet new people, especially guys that I am interested in. I never know at what point to disclose that hey, my brain is neuro-atypical (although I'm not totally convinced the whole world doesn't have depression, but that's for another blogpost) and sometimes I am extra irritable and sad and tired, but that's okay. There is still such a strong stigma surrounding mental illness, and I guess that's my biggest concern in dating. I tend to avoid asking for help from anyone because I'm annoyingly independent, and I definitely do not want to feel like a burden on someone else. Especially in a new relationship when I want to be cute and fun, I don't want to tell someone that I have Depression and Anxiety and have them worry or run away. I wish it wasn't like that, but people get scared, even when they don't need to be — I've seen it in my own life multiple times (which is unfortunate because I'm pretty great, so whatever, their loss). For the most part, my experiences are manageable. I have off days where everything seems more difficult than it needs to be, but I have taken the necessary steps in the last few years to take care of myself and make my mental health a priority. I am not my Depression and Anxiety. I have Depression and Anxiety, but I am so much more than that. 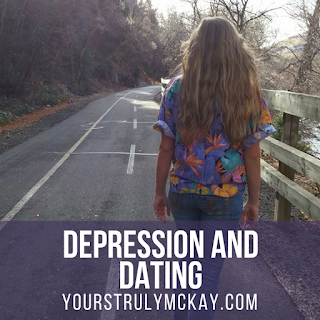 What I've learned in dating with Depression is that the right person won't be scared away. It freakin' stinks when someone doesn't want to be with you for such a ridiculous reason (although they won't always admit that that is the reason, but other than that I'm basically perfect (just kidding) so I don't know what else it could be (@ every guy in the world who isn't dating me, especially Chris Evans)), but at the same time, you don't want to be with someone who is going to run away scared. I'm not saying that you have to unload your deepest struggles and fears before you've even kissed the guy, but you shouldn't be afraid to get the support (and give the support) that is needed. You need someone who will stand by your side, love you, and give you help when you need it. And you need someone who can trust you to do the same. You don't need to hide who you are. You don't need to be afraid to ask for help. And you don't need to settle for anyone who doesn't think the sun shines out of your heart. You know when you're sitting in church and they're saying the closing prayer and the person is like "help this nourish and strengthen our bodies" and you're thinking like, God can perform whatever miracles He wants but I don't think He's gonna make that seminary donut become magically nutritious. That is because most of the time, when people pray and say "help this nourish and strengthen our bodies," that is a vain repetition. Don't get me wrong, there is nothing bad about saying that, and on the flip side, it's good to say that if you are genuinely meaning it. 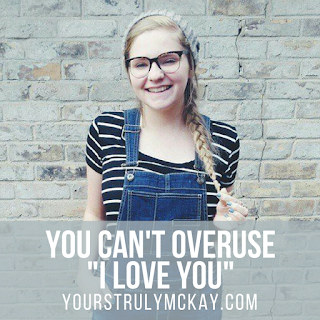 You can't overuse "I love you." I think it follows the same rule as asking God for something to "nourish and strengthen your body." There is nothing wrong with telling someone you love them a lot as long as you mean it every time that you say it. You can never tell someone that you love them too often. In my opinion, it is something that people will always need to hear. It does not necessarily lose meaning the more often you say it, unless that is the mindset that you are in. If you genuinely express your love, there is no vain repetition of it. Two new Star Wars movies have come out. I hope you get to watch them up there, and maybe even with Carrie Fisher sitting in the seat next to you. A new Harry Potter movie came out too. Seriously, they better have like an Alamo Drafthouse-style theater for y'all. One Direction broke up (I think????). Harry Styles cut his hair (I think???? (I kinda stopped paying attention to them after you died (and after Zayn left))). You missed out on all the Hamilton hype (which I am very much still hyped about) so I hope you get a chance to listen to it. I graduated from college. I wish you could be here when I walk in a few weeks. David and Mom and Dad are all coming. And I wish you could meet Fonzie. You would love him (even if he's a brat). I'm your age now, or the age you were when you left. I worked my first grown up job. I went to Disney World and Comic Con (I met Weird Al). I also met a new boy. He writes music and I think you would've really really liked him. I kinda do too. Donna is pregnant and so is Kyle's wife. I still feel like a kid, so that blows my mind. 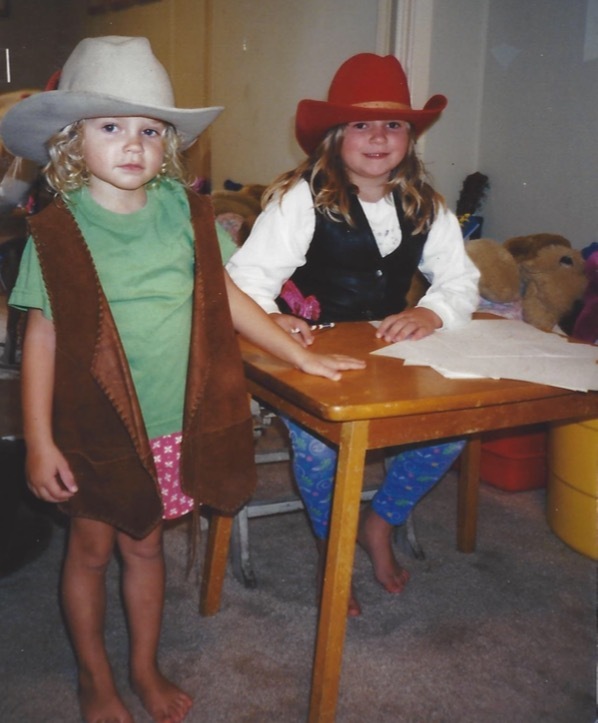 I wish you could be here to see it all. It's scary to think that it's been just eighteen months and so much has happened. I don't want to think about how many more things will happen down here that you'll miss out on. I'm always thinking of you. We all are. I'm trying my best not to forget anything. I love you. And I hope you're doing okay. If you know me, you know that I don't get embarrassed easily (if ever). 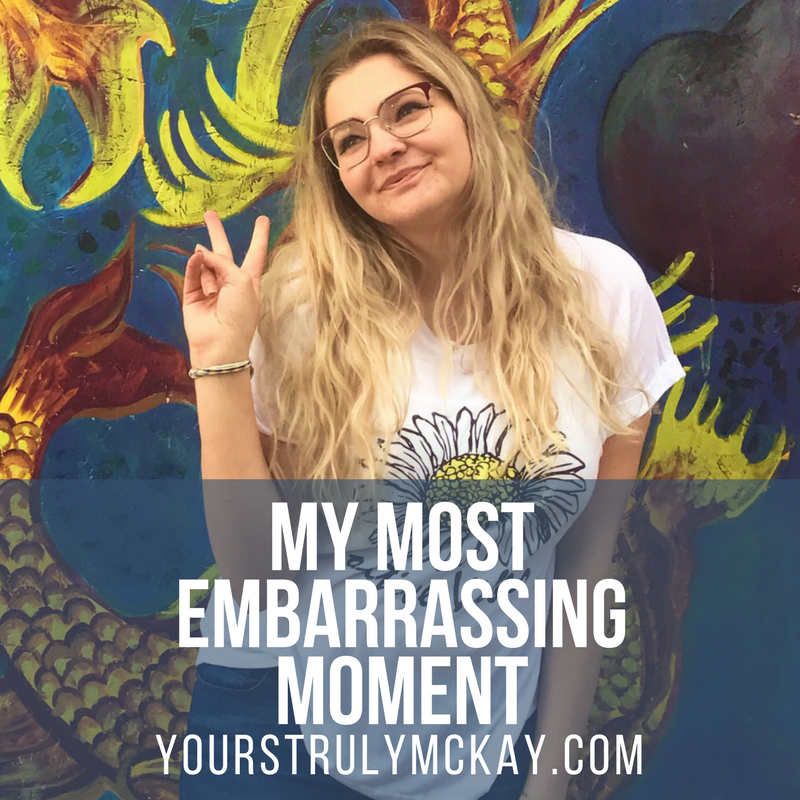 As soon as this experience happened to me, I knew it would be that story that I could tell people when you have to go around in a circle and introduce yourself and say the most embarrassing thing that you've ever done. I only went to EFY once. I was 17 years old, and I flew out to Utah so that I could see BYU campus (and to feel the holy spirit (and meet cute Mormon boys)). Again, if you know me, you know that I am pretty good at remembering names. Not necessarily in a "I met you once and you said your name briefly" sorta way, but I am weirdly skilled in the "we all went around and said our names in a group and I got them down immediately" way (don't ask me the science behind why I can remember a group of names but probably not an individual name). On the first day of EFY, I was overwhelmed with the amount of cute boys in my group (because hello, there was like one cute Mormon guy in my hometown)). I quickly learned all of the names — not just the boys', if that's what you're thinking. I was bragging about it to my counselor, and she challenged me to go around the circle as she randomly pointed at members of our group and had me name who that was. We came to Landen. Poor guy. My counselor pointed to Landen, and with complete and utter confidence, I yelled out "LEBANON!" Like there was literally no hesitation. I was so sure in my mind that his name was Lebanon and then it came out and everyone (especially me) was like ????????????. I blame this on the fact that I was basically in a foreign country and there were lots of cute boys and I was an awkward 17 year old (and now I'm an awkward 22 year old, so not much has changed). Needless to say, Landen was known as Lebanon for the rest of the week, and we all had a good laugh about it (and I'm honestly still laughing to this day). 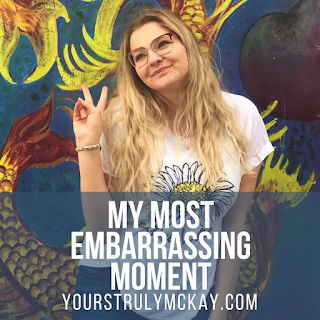 So now you know the most embarrassing thing that I've ever done, and I'm publishing it here for the world to read. Sorry again, Landen. Okay, it's not necessarily that I don't like them — I think I'm mostly just scared of them. I like to blame this on the fact that I am the youngest child. I also did very little babysitting when I was a Mia Maid (I don't know why I missed that boat?). I think I've also convinced myself that all children hate me and therefore I don't like them. Also I don't think anyone is a fan of wiping people's butts. Being an unmarried 20-something in Happy Valley, Utah has its ups and downs. Every girl and their dog here is baby hungry, and I honestly just can't relate. My friend Megan has a three month old, and when I was visiting her tonight, Declan spit up while I was holding him and my immediate reaction was to scream. I'm not joking. I screamed and Megan and her husband and my boyfriend all laughed at me and I was sorta mortified. I know that I don't fit into that wannabe-mom stereotype of girls my age, but I do want to be a mom. When I was in high school and my self-esteem was extra bad, I used to write down compliments that people gave me. I think about three-quarters of what I wrote down were my friends telling me that I would be a good mom. I want to be a mom. Really badly, actually. I'm just scared that I won't be a good one. I'm scared my own children will hate me, because people tell me that supposedly my own children will like me. I'm scared I won't love them unless I get to adopt cute children as my own. I guess I'm just embarrassed. I know I'm supposed to like children — not from a feminist standpoint, because I don't have to have children if I don't want to — but as a Mormon. There's a lot of pressure to have a happy, well-dressed family, and y'all know I'm just trying to be a Mommy Blogger anyways. I really want to like children, but when Megan told me that she sits at home most days and watches Netflix trying not to make Declan cry, my immediate response was that I, too, sit at home most days watching Netflix, but I'm trying not to make myself cry. Maybe I'm just an immature baby myself and that's my problem. Maybe I haven't met a man yet that I'd be willing to let him put me through nine months of growing an alien (basically) inside of me. Maybe there's something wrong with me. Maybe I'm just perfectly content with my cat-son. Maybe things will change. Maybe they won't. Maybe it's Maybelline. 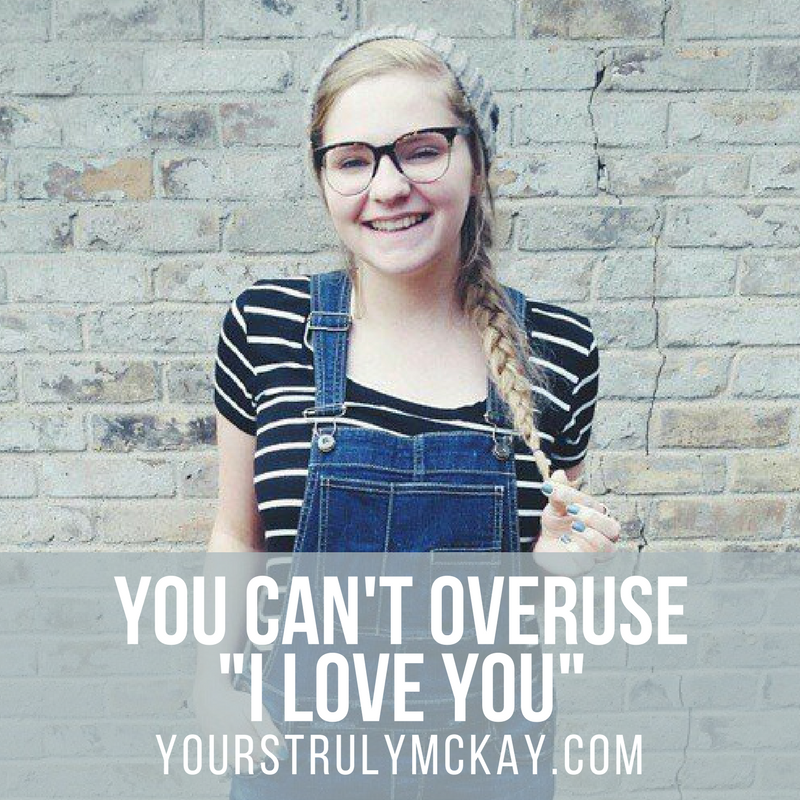 You Can't Overuse "I Love You"